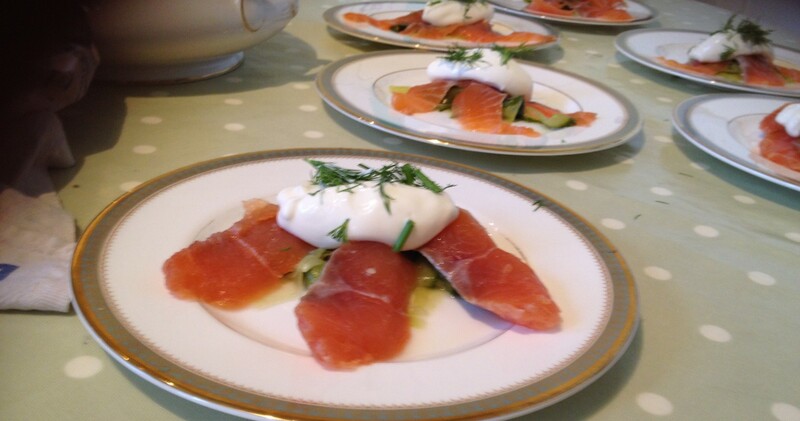 I have a strict rule of thumb since I’ve started cookery school; no late nights/drinking during the week. Since I am commuting from Oxfrd to London on a daily basis I can’t afford to get tired or turn up hungover while wielding a knife. But then again rules are made to be broken, and what a way to break my rule. 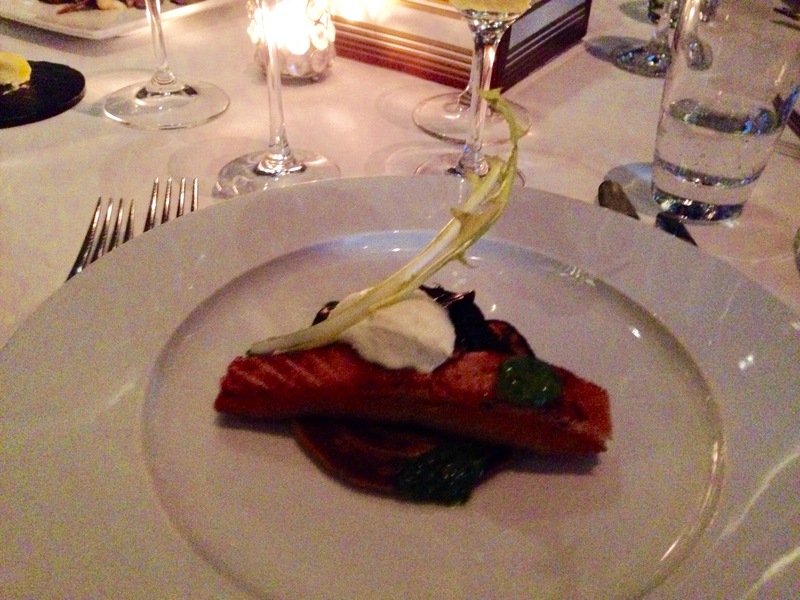 Remember the amazing dinner at Le Manoir I blogged about a few weeks ago? Le me refresh your memory. 7 course tasting menu, fantastic conversation, caught up with Raymond Blanc? 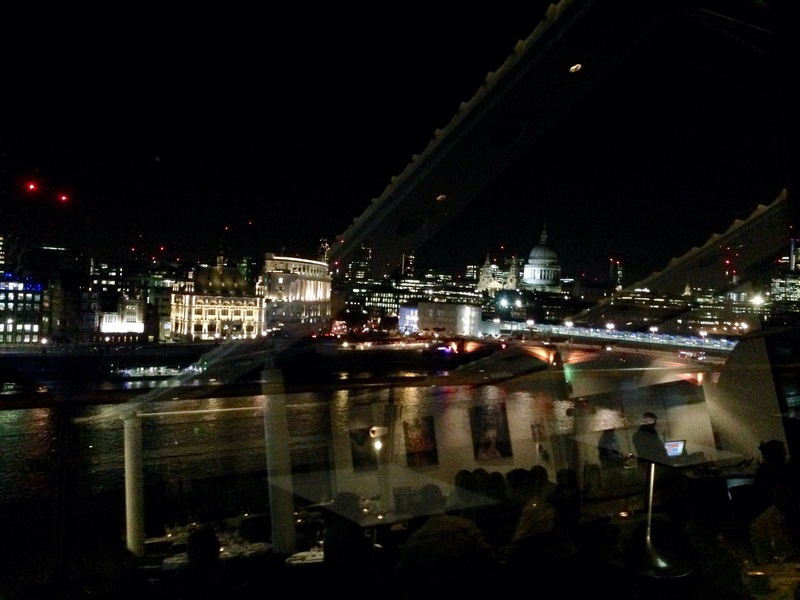 Well when the same line up invited me out for dinner again at the OXO tower in London I wasn’t going to turn it down. I have been to the OXO tower once before, but not to eat. Since my sister moved to a London we’ve gone out of our way to find fun, quirky things to do in London together, preferably cheap, in order to spend time together (apparently my scintillating conversation isn’t enough….) one of our favourite things to do is a treasure hunt . We might both be suffering from Peter Pan syndrome but there is just something about walking around and discovering London (new for us Oxford-folks) through a series of cryptic clues sent to your phone. http://www.inthehiddencity.com/london-treasure-hunt/ I sound like I advertise for them, I don’t (I wish, maybe I should….please let me!! ) go anyway. One of our hunts we ended up on the top of the OXO tower. I can’t exaggerate the view enough. It is phenomenal. You can see the entire line the river, St Paul’s, the Shard, Buckingham palace, and guess what, it’s even better at night. I arrived 15 minutes early and twiddled by thumbs at the bar. Normally I am never so impolite (although seriously- who really believes you should never be on time for a dinner party, clearly someone who has never cooked a dinner party) but storm Jonas was raging outside and I was cold. So consequently I stared at the view for 15 minutes. I probably could’ve stared at it for 30mins and it would’ve still been as mesmerising. I know we go to restaurants for the food, but actually for me (a major foodie) if the atmosphere isn’t there, the restaurant falls short. On the other hand, if the restaurant has amazing atmosphere I might forgive it a few food points. It might have been necessary here, but I can’t complain, I lucked out. I started with a melting salmon confit on a sweet potato pancake, beetroot and horseradish cream; other table dishes included the addictive salty langoustines with garlic butter and a platter of duck for two with Jerusalem artichokes and gingerbread. Then. What a main course. 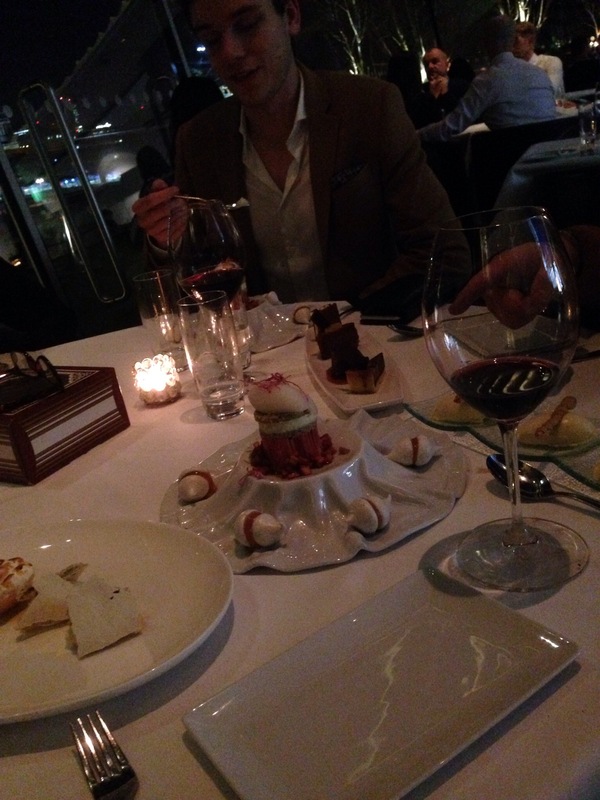 I reluctantly agreed to share the Chateaubriand, just to help out a fellow foodie. It was cooked perfectly, a dark pink centre, complemented by melting buttered girrolle mushrooms and an intense beef jus. The Gruyere cheese mash was also something special. I apologise for not getting a photo, I was too busy savouring the meal. My only complaint would be that the carrots, while beautifully presented as whole baby carrots complete with tops, were hard as rocks, a little hard to eat. Unfortunately the Venison Wellington (shared by one set of father/son) fell short. Restaurants really ought say if they include such a dominant flavoured blue cheese in a dish. The beef fillet with cauliflower and walnut dressing promised a lot but seemed a little dull and small for its price. Again the vegetarian at the table commented that whilst ok, her butternut squash dish was nothing special, a shame when vegetarianism is being explored in such an exciting way at other restaurants currently. Despite being rather full from the main, my pudding stomach was fairly excited by the array of desserts. So of course we decided to split a few. The Rhubarb mousse, gin sorbet and earl grey meringues boasted some impressive flavour in the meringues, less so with the sorbet (honourable mention to the octopus inspired presentation plate). The lemon meringue pie and cardamon ice cream melted in the mouth and the chocolate plate lived up to its reputation. It was rich (probably a good thing we were sharing) but the smoked white chocolate mousse alone was worth it. Finally a quick mention about the drinks. Well worth a try is the martini menu. A perfect martini should be ice cold, but not watery, biting and either salty or faintly sweet and the Oxo tower had something for everything on the spectrum. I enjoyed tantalisingly labelled 1953 or the Vesper (yes I do think I’m James Bond) gin, vodka and aromatised wine with a lemon twist, shaken not stirred. I could easily come back just for the view and another martini. The Atmosphere gets a 9 from me, the food a solid 7, the drinks push up to an 8 and the company is always a 10. 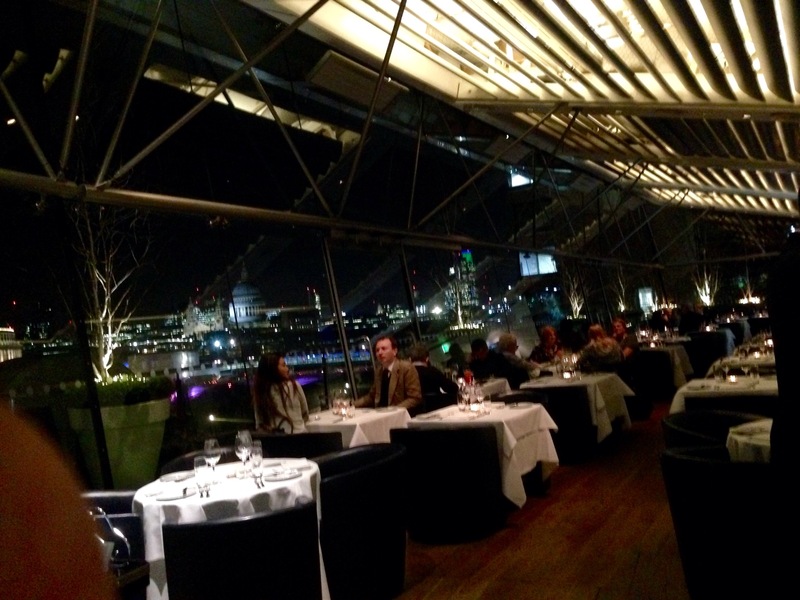 This entry was posted in Experiences, London, Restaurant Reviews and tagged London, martini, oxo restaurant, Steak. Bookmark the permalink.